Church Library Month is my theme for October, and I'm seeking out mystery series with characters who have been called to the church... and to crime. Last week, I talked about nuns who solved crimes, so there's no way I could ignore the priests. The Catholic Church isn't the only religious organization that has priests, so not all of these characters will be tonsured and wearing scratchy robes. Let's see who's on board this week! Ellis Peters is the pen name of Edith Pargeter, an author who translated Czech classics and wrote excellent history and historical fiction. 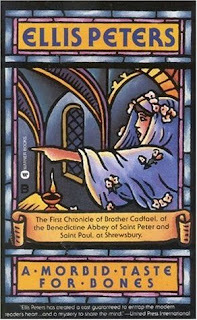 She is most well-known for her wonderful historical mysteries featuring Brother Cadfael, a twelfth-century monk and herbalist in Shrewsbury, England. In fact, I don't think it would be too far off the mark to credit her with responsibility for beginning the popularity of this particular subgenre. 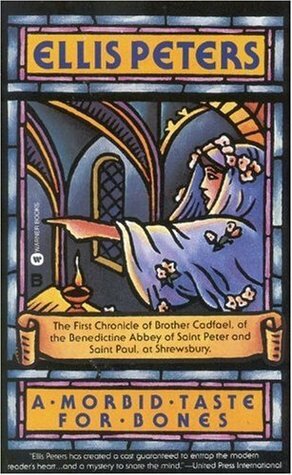 Also, as many of you know, her Cadfael books were the basis for a first-rate television mystery series starring Derek Jacobi. There are twenty-one books in this marvelous series. The first three are: A Morbid Taste For Bones (1977), One Corpse Too Many (1979), and Monk's Hood (1980)--winner of the Silver Dagger Award that year. G. K. Chesterton was an English writer who had a prolific and diverse output. This output included philosophy, poetry, plays, journalism, lectures and debates, literary and art criticism, biography, and Christian apologetics. Quite a figure in his day, now he is probably best known for his mystery series featuring Father Brown, a gentle, quiet little cleric in England. There are five short story collections featuring Father Brown. 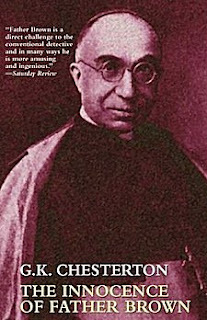 Three of them are : The Innocence of Father Brown (1911), The Wisdom of Father Brown (1914), and The Incredulity of Father Brown (1926). 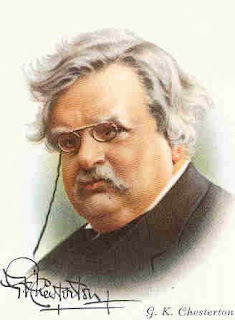 The first of G.K. Chesterton's books about seemingly hapless sleuth Father Brown collects twelve classic tales: "The Blue Cross," "The Secret Garden," "The Queer Feet," "The Flying Stars," "The Invisible Man," "The Honour of Israel Gow," "The Wrong Shape," "The Sins of Prince Saradine," "The Hammer of God," "The Eye of Apollo," "The Sign of the Broken Sword," and "The Three Tools of Death." Julia is the creator of the mystery series featuring Clare Fergusson, a newly ordained Episcopal priest, and Russ Van Alstyne, the Chief of Police, in Millers Kill, New York. 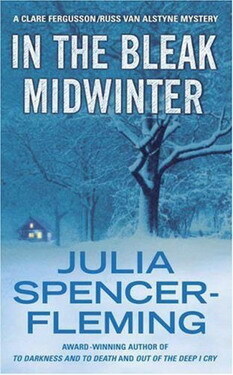 There are currently seven books in the series, the first three of which are: In the Bleak Midwinter (2002), A Fountain Filled With Blood (2003), and Out of the Deep I Cry (2004). In this debut novel, a riveting page-turner from start to finish, born-and-bred Virginian Clare Ferguson, newly ordained priest of St. Alban's Episcopal Church in the small upstate New York town of Millers Kill, is faced with not only an early December snowstorm and the bitter cold of her first Northern winter but also a conservative vestry, who apparently expended all their daring on hiring her, a female priest. When a baby is left on the church doorstep with a note designating that he be given to two of her parishioners, Clare calls in police chief Russ Van Alstyne. The foundling case quickly becomes an investigation into murder that will shatter the lives of members of her congregation, challenge her own feelings and faith and threaten her life. With her background as an army helicopter pilot, Clare is not a typical priest. Smart, courageous and tough, she is also caring, kindhearted and blessed with a refreshing personality. Likewise, the other characters are equally well developed and believable, except for the young pediatrician, who speaks more like a hip teenager than a professional. It is a cast readers will hope to meet again, while a fast-paced plot keeps the guess work going until the very end. Along the way, there is an exceptionally spine-chilling confrontation. The vivid setting descriptions will bring plenty of shivers, but the real strength of this stellar first is the focus on the mystery, which will delight traditional fans. Several people have suggested this series to me, and after doing this research, guess what? Yes, a copy of In the Bleak Midwinter is on its way to my mailbox! 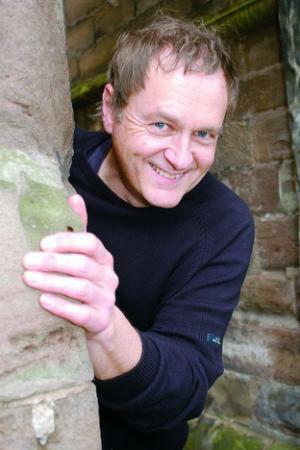 Phil Rickman was born in Lancashire, but has spent most of his adult life in Wales and the Border country, where he won a couple of awards for his work as a BBC radio and television news reporter. He lives near Hay-on-Wye with his wife, Carol-- they met as journalists on the same paper-- and a bunch of animals. He still writes and presents radio features including the book program Phil the Shelf on BBC Radio Wales. He also writes the Merrily Watkins mystery series. 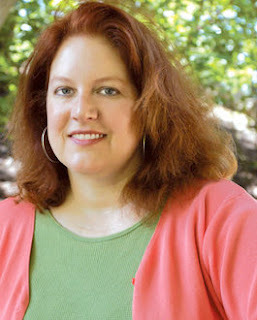 Merrily is an Anglican priest and single mother who lives near the Welsh border in northeast Herefordshire, England. 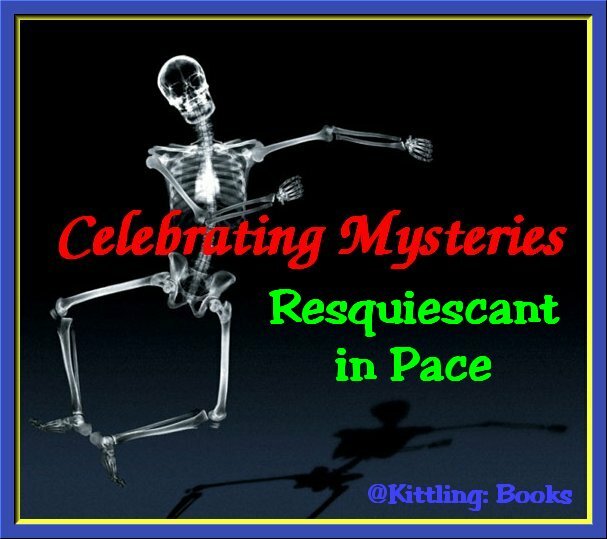 If you like stories with plenty of meat on their bones, excellent characters, and mysteries with a decided chill factor, join in with me in reading these books. The first three of eleven books in the series are: Wine of Angels (1998), Midwinter of the Spirit (1999), and Crown of Lights (2001). In the U.S. release of Rickman's first title featuring Rev. Merrily Watkins and her teenage daughter, Jane, Rickman crafts a first-rate thriller with supernatural overtones. When Merrily takes up residence as the newly appointed priest-in-charge in the picture-perfect community of Ledwardine, she discovers a pagan influence lurking beneath the town's sunny surface that links the community to a horrific, centuries-old murder. In resurrecting the 17th-century murder in the form of a play, tensions between the townsfolk come to a head, and it's up to Merrily to resolve their issues. Rickman deftly illuminates the intrigues of village life and the conflicts between new residents and well-established families; teenagers and older generations; and Merrily and the town's more conservative members. 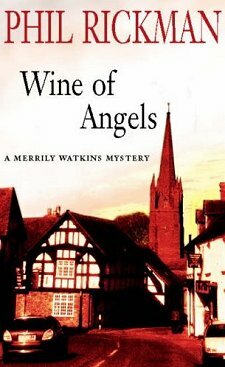 Throughout the story, apples and cider, which is "the wine of angels," is the prevailing image, and it ties in nicely with the pagan traditions and superstitions that plague Ledwardine's past. Although this hefty novel trundles off to a slow start, quirky characters, an abundance of plot twists and an exhilarating conclusion ensure that readers will enjoy this tale. Hopefully, like me, you've added a book or two to your wishlists. Join me next weekend for another look into mystery series that have a lot of faith! 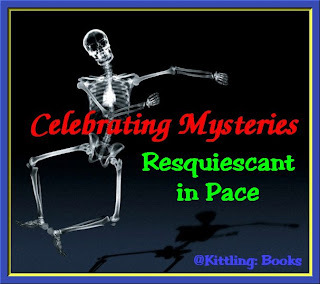 I haven't tried any of the mysteries by Julia Spence-Flemming so will be adding her to my wishlist pronto. I've read some of the others and probably like you, have Ellis Peters to thank for my love of historical mysteries! 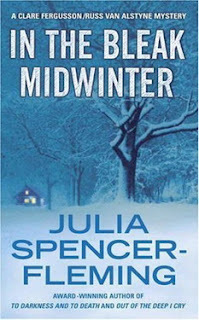 I've read and loved Julia Spencer-Fleming's series. I have the first Phil Rickman book and understand that his series is quite spooky. Have not read the others. I used to like the Father Blackie (or I think he became a Bishop) by Andrew Greeley. It's been a long time since I read them though. Sakura-- I hope we both enjoy her books! Kay-- I tried one of Greeley's books, but I didn't particularly care for it. Probably yet another case of letting the years pass, then picking up the author again and finding enjoyment! Are any of us the same readers we were a decade ago? Barbara-- Jacqueline Winspear writes the Maisie Dobbs books, so please don't get yourself (or me for that matter) confused! Yes, Dorte should know a thing or two about bloodless vicars!